Dead Even by Frank Zafiro, a Mysterious Review. 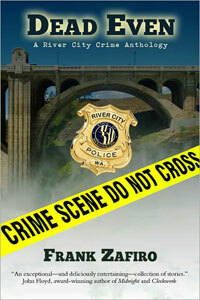 Review: Fifteen short stories by Frank Zafiro are included in Dead Even, an anthology featuring five characters, cops and criminals, from the author's series of River City crime novels. Many, maybe most, of the stories are largely character studies, without much emphasis on storyline or plot development. Fortunately the characters are interesting and worth spending time with. They are inserted into a situation relevant to their respective positions or situations, and a scene is played out. There is some interconnection between the stories, and, to be sure, there is sometimes a twist or two to catch the reader off guard, but the point of the individual stories — indeed, the entire anthology — seems to be to present existing characters from the novels in a different light. The author also provides context for each character from his own perspective, prefacing each section with some background information that is both enlightening and entertaining. Officer, later Detective, Katie MacLeod is the first female character he wrote in first person. "I thought it might be strange or difficult, but I didn't find it to be either one. … [M]aybe gender identification as a writer isn't as rigid as I'd feared." Or with Dominic Bracco, the "proto-typical New Jersey mobster" in exile in Washington State. "He's selfish but smart, charming but cruel. But as is always the case with a villain protagonist, I tend to find things about him I like." Dead Even presents a solid introduction to both the author's narrative style and the characters he's created to populate his stories. No doubt, many readers will subsequently seek out the novels to see how they fare in a more fully developed environment. Acknowledgment: Gray Dog Press provided an ARC of Dead Even for this review.